If you’re a regular reader to the Wineware blog, you’ll realise that Whisky is fast becoming a big competitor to my love for Wine. It’s going to take a lot of time to overtake my fascination and general love for Wine, but Whisky is certainly a good ‘go to drink’! Anyway, what better way to kick-start the weekend than a visit to Butlers Wine Cellar in Brighton (www.butlers-winecellar.co.uk) on a Friday evening to find out if whisky does actually go well with Cheese. I admit, I was sceptical to start with but it really does work, and it works extremely well! Around 30 eager customers paying a very reasonable £30 per head were welcomed by the proprietor, Henry Butler (see @wineboxtv (Twitter) and www.winebox.tv) and his assistants Cassie, Will and Mark. Proceedings got underway at 7.30pm and it was standing room only but there again, it always is as there are never any seats (and it wouldn’t be the same buzz and atmosphere if there were)! The 6 Scottish Whiskies which were tasted (consumed) in the fantastic Glencairn Whisky Glasses were ably described and demonstrated by none other than Dave Broom, the renowned Whisky and Spirits writer, whilst the Dutch cheeses were offered and enthused upon by Rosalie Van der Meulen of Rose’s Dutch Cheese Co, which can be found at the North Road, Brighton Farmers Market on any Saturday. The two presenters had previously tried and tested all the pairings to make sure they worked (thankfully!). It could not have been easy because of the very varied textures of both the whiskies and the various styles of cheese but they did combine well, although some obviously better than others. – A Balblair 2001 (a light and fresh spicy whisky) was matched with a Boeren Stolwijker Gatenkaas (a 7 month aged Goats Cheese). – An Old Pulteney 12 year old (a fruity and slightly toffee tasting whisky with a hint of smoke and sea salt) was paired with a Rouvener, a 5 months aged Goats Cheese. – The an Cnoc 12 year old (non sherried Speyside with spice and light citrus notes) was matched up with a 14 month aged Sheeps Cheese. – The Antiquary 21 year old (a blended Highland and Speyside whisky with a touch of Islay, peaty, yet fruity and wonderfully smooth) was twinned with a 2 ½ year old ‘Good Old Amsterdam’. – A Tomatin ‘Decades’ (a malt created to celebrate the Master Distiller, Douglas Campbell’s 50th year with the distillery) – intense tropical fruit and Christmas cake flavours with a hint of nuttiness was paired with a 4 year old ‘Very Old Beemster’. – And finally, The Peat Monster, which is exactly as it says on the tin – big, smoky, earthy and peaty – like a bonfire on the sand dunes was admirably matched with a Boeren Stolwijker Old Gouda (a 3 ½ year aged Sheeps Cheese). After each dram was tasted with its respective cheese being munched alongside it, we were encouraged by Dave to register an Mmmmmm factor by mmmmmming as to how much we had all enjoyed the pairing. 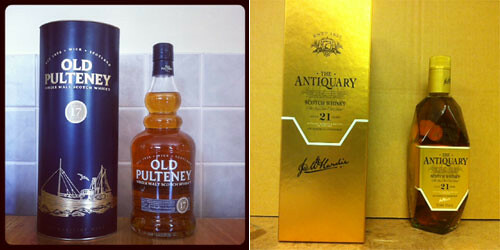 The biggest Mmmmm’s of the night went to the Old Pulteney and Rouvener and the Antiquary 21 year old with its Good Old Amsterdam – at least that’s what I seem to remember! Many thanks to Henry, Dave and Rose for a first class evening and if it is ever offered again – don’t miss out, I definitely recommend it!